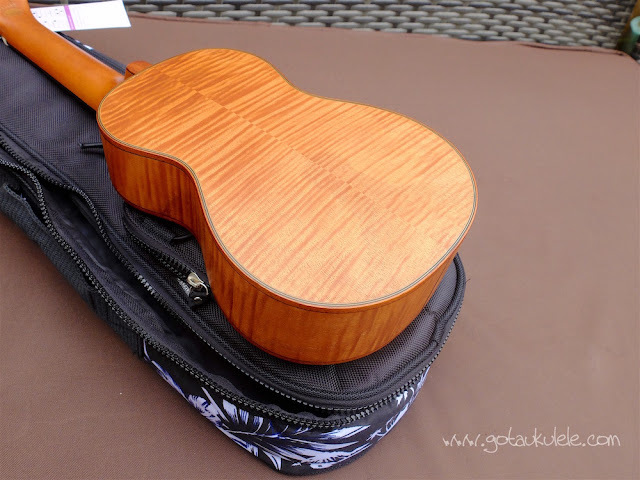 Another Mahalo ukulele on the Got A Ukulele reviews bench. 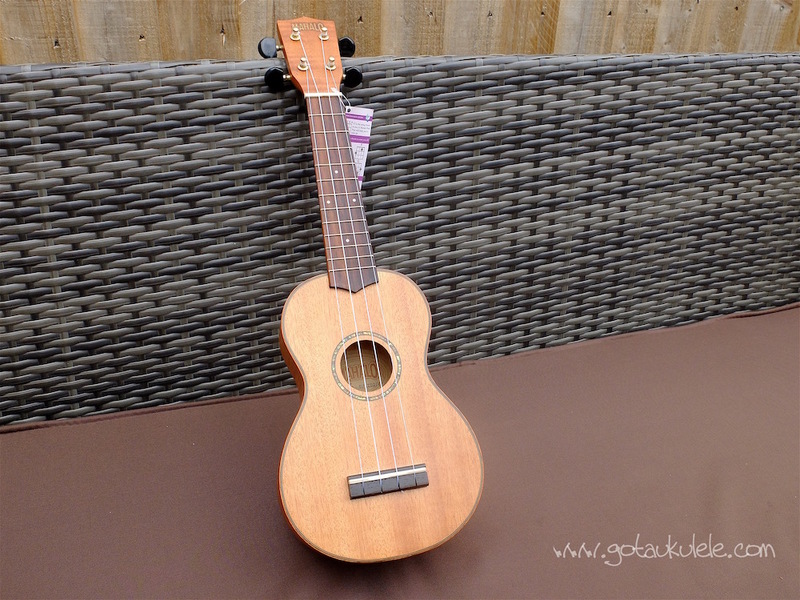 This time another soprano, but one of their slightly higher end models - the 2016K soprano. 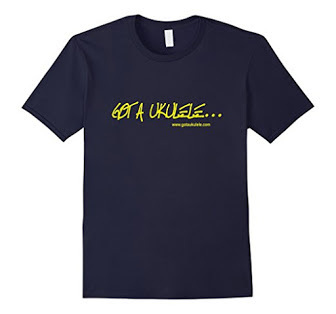 This one also goes under the less glitzy name of the Mahalo U/LTD2/G ukulele, and what all that stands for I have NO idea. 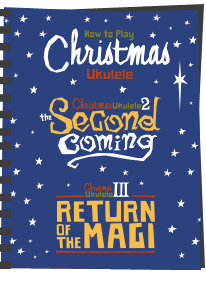 I'm told that it's a Limited Edition (no idea what makes it Limited - it's readily available in loads of stores), but the confusion doesn't end there as you will see. 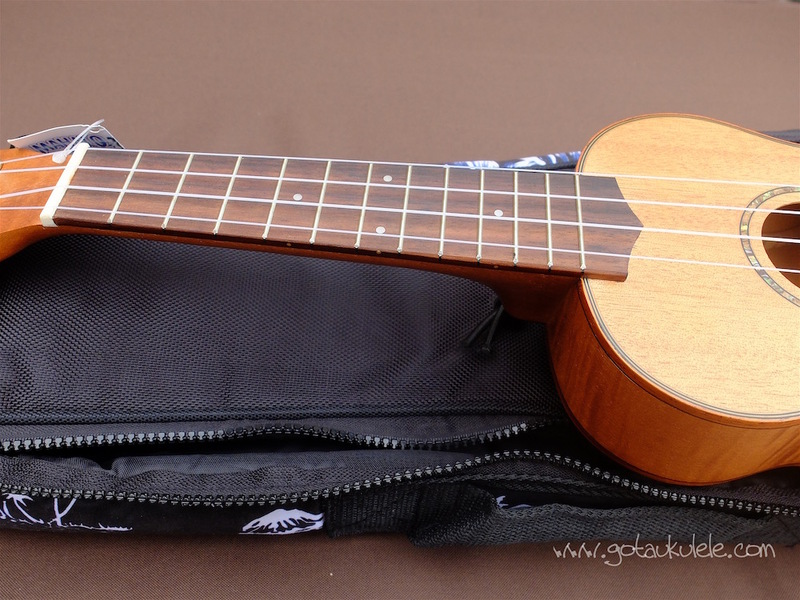 The 2016K is a standard shaped soprano scale instrument, with a double bout, and a fairly flat base. It's also made from a variety of woods. Firstly we have a solid top made of mahogany. It's hard to tell, but I think it's in two pieces, but the very straight mahogany grain leaves nothing really to bookmatch. Regardless, it's a nice piece of wood and no complaints here. I suppose it's pretty plain on top, but I have a liking for plain looking mahogany sopranos. Things get more confusing when we go to the back and sides. These are made from laminate wood with an outer veneer. Most dealers suggest that the outer veneer on this is koa, and from the stripe, I can see why. Saying that, the stripe is a little uniform and a check on the Mahalo website says the outer veneer is Malapoga wood. I know very little about malapoga and have never seen it on an instrument, but I believe it's a type of cedar. Answers on a postcard please.... Anyway, whatever it is, it does actually look nice and I do like the stripes. Being laminate of course it wont affect the tone distinctly so perhaps it doesn't matter what it is! If I sound confused though, it's because I am! The back is very slightly arched and made from two pieces, and the sides are also in two pieces with an inlaid wooden stipe at the base join. Decoration wise we have a few things and they are not overly blingy. Firstly we have some thin black white black edge binding on the top and back together with some wood edging on the binding too. It's not overly done and I think looks very nice actually. Around the sound hole we have an abalone inlay which doesn't match the binding but again is nicely done. The whole of the body is finished in a satin coat which also tones down the bling and gives it a rather nice tactile finish and look. Unlike many Mahalos I have looked at, the finish on this one is pretty good actually and I am not spotting any rough patches, drips or bubbles. All ok on this front. The bridge is a rosewood slotted type and the saddle appears to be NuBone and is compensated to assist with intonation. Inside the instrument is nice and tidy too, with notched kerfing and no glue blobs. The bracing looks a little chunky to me, including a back brace that is not only overly thick but questionable on a laminate back in any event. Up to the neck and this is made from 'nato' wood and is finished in the same satin. It's made from three pieces with a joint at the heel and one at the headstock. The heel is also nicely capped with a sliver of mahogany. Topping the neck is a rosewood fingerboard. It's unbound at the edges, but looks to be in good condition. We have 12 nickel silver frets and none past the body join. They are actually a little sharp on the edges, but a good store can easily tidy these for you I suppose. We have pearloid position markers at the 5th, 7th and 10th spaces and these are thankfully repeated on the side. Past the nut, (which appears to be made of plastic and not NuBone like the saddle) and we have a generic crown shaped headstock, complete with a screenprinted Mahalo logo. I said in an earlier review that I think the Mahalo logo looks cheap and old fashioned now and I still think that. The tuners are a real letdown - the same dolphin shaped brass open gears that adorn so many Mahalo instruments, complete with MASSIVE black plastic buttons. They are grindy to use (some are looser than others) and look, frankly, horrible. 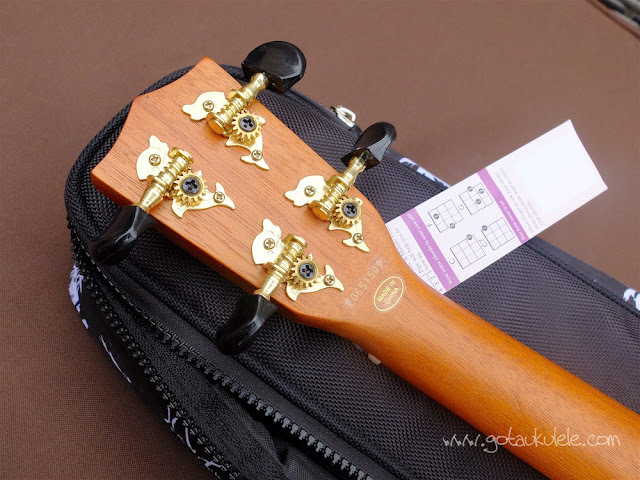 I dont like geared tuners on a soprano at the best of times, but if you are going to use them, please dont choose ones with tuning pegs that would fit a guitar. It looks silly and can affect the balance of the instrument. Completing the deal are (what else) Aquila strings and a rather nicely made padded and branded Mahalo gig bag. And all that for.... £80. So a pretty nice price really. 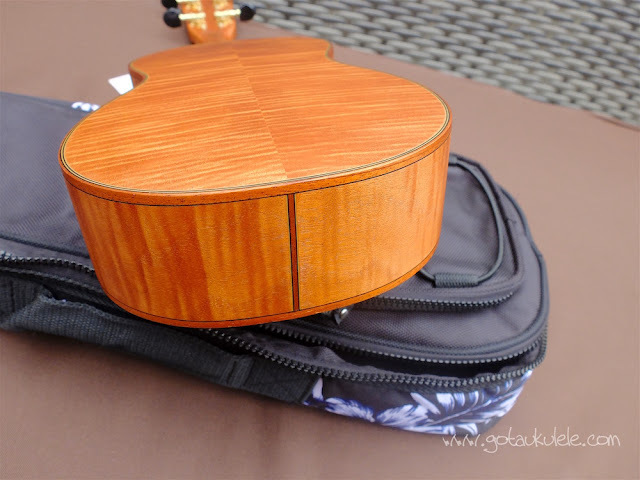 So as you have probably gathered, this is not what most people think about when they think Mahalo and it is a far cry from the brightly coloured cheap ukuleles that flooded the market in the Mahalo name. 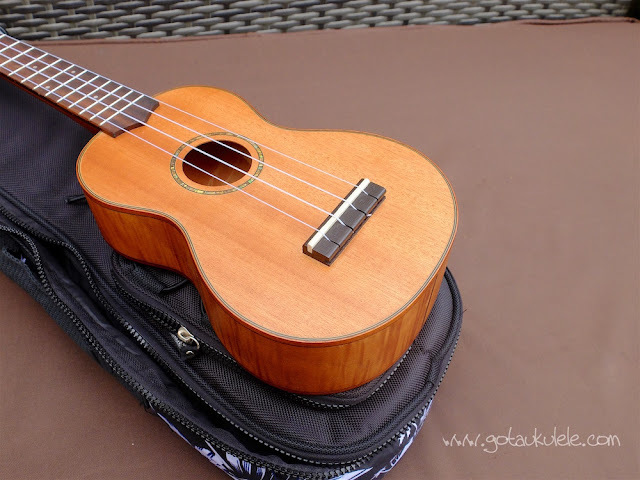 It's actually a nice looking solid top instrument for a pretty reasonable price. Is the playability a let down though? Well, the body is pretty light and comfortable to hold, and that satin finish is nice on the fingers. Sadly it's totally neck heavy on account of those mahoosive tuners. If you try to balance this at the 12th fret the headstock just dips to the ground. 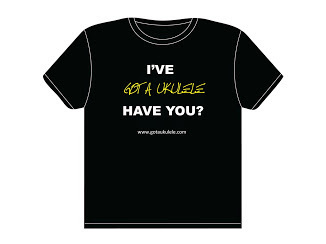 More established players wont perhaps notice it, but beginners learning to hold and play the ukulele for the first time will find they fight against it. This would be so easily solved with different tuners. Setup wise, the action at the saddle is perfectly acceptable. A little high for my liking but within reasonable tolerances and easy to take down. 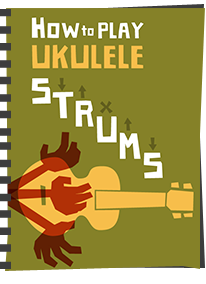 The nut however is cut too high, particularly on the C and E strings, meaning intonation issues at the first and second fret. Whilst the saddle is easily remedied by a beginner, the nut is a more complex job. And there is no point throwing a compensated saddle on an instrument if your setup then undoes all the work on tightening up the intonation.. 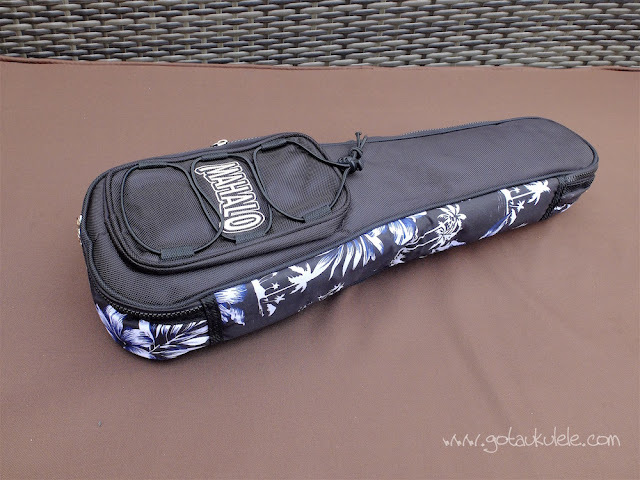 The sound is actually far better than I imagined it to be, and I will stick my neck out to say it's the nicest sounding Mahalo soprano I have ever played. Volume is just about acceptable, although I would prefer a little more bark and bite from a soprano. Perhaps it's being hampered by that thick bracing. No real punch to it, but it would hold it's own I think. 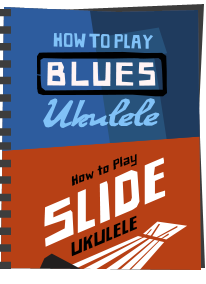 It's not the sweetest tone in the world and it can get a bit one dimensional when strumming and can get a bit muddy and confused. Sustain isn't too bad, but as a whole it just doesn't really set me alight. Massively better than a lot of the Mahalo stable, and perfectly acceptable as a cheap soprano though. 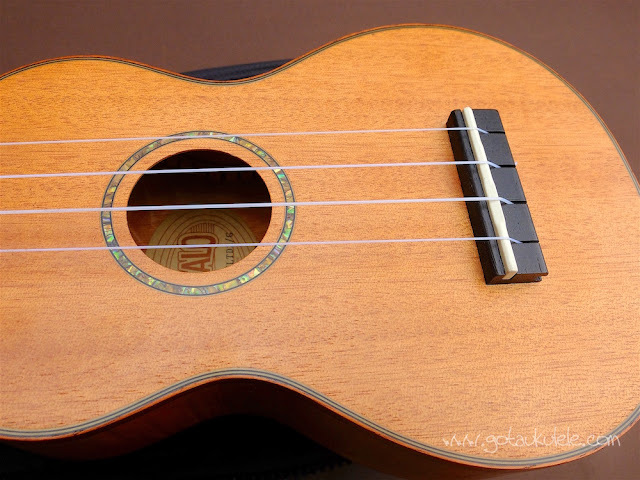 I also think that it's a shame that Mahalo strode away from the ultra cheap, creating a nice looking instrument with a solid top, but then totally let it down with terrible tuners. And that I suppose is my main gripe with it. At £80, yes, it's reasonable on the face of it, but I think I would be more pleased with a decent fully laminate instrument from the likes of Kala or Baton Rouge or perhaps a solid topped Ohana for the same sort of money (or less). 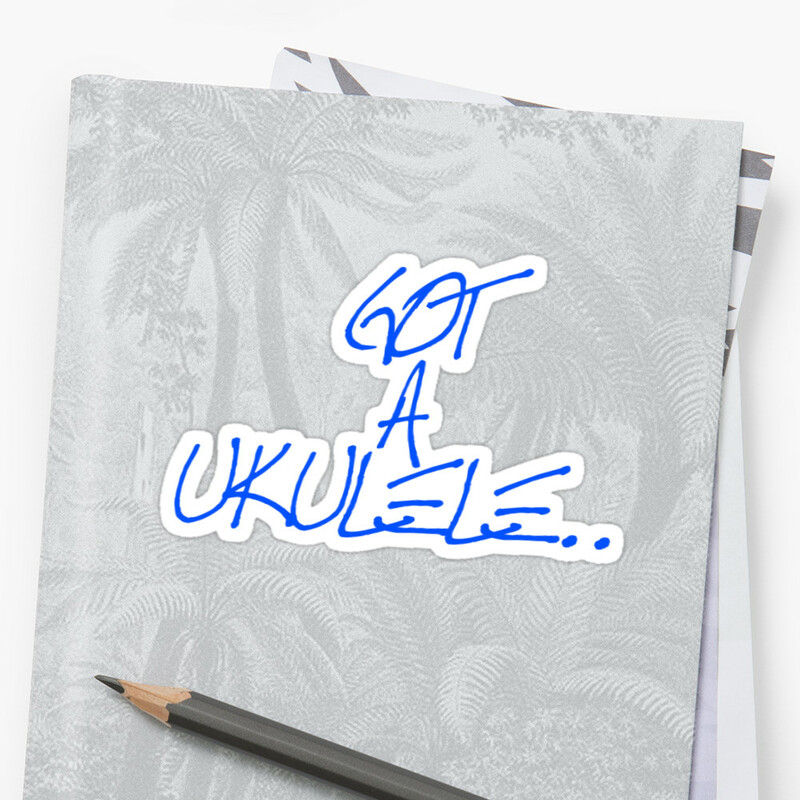 Saying that, it really doesn't fit in the 'avoid Mahalo at all costs' category and is a quite passable instrument. Mixed feelings I suppose and it will serve you better than a lot of the real cheap and nasty stuff out there. Shop around though! 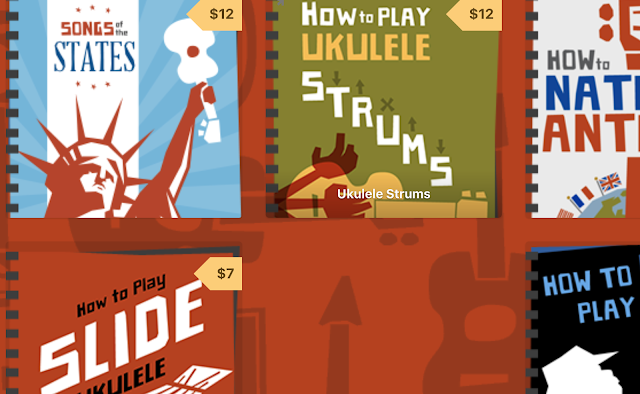 Be sure to read all my other ukulele reviews here! 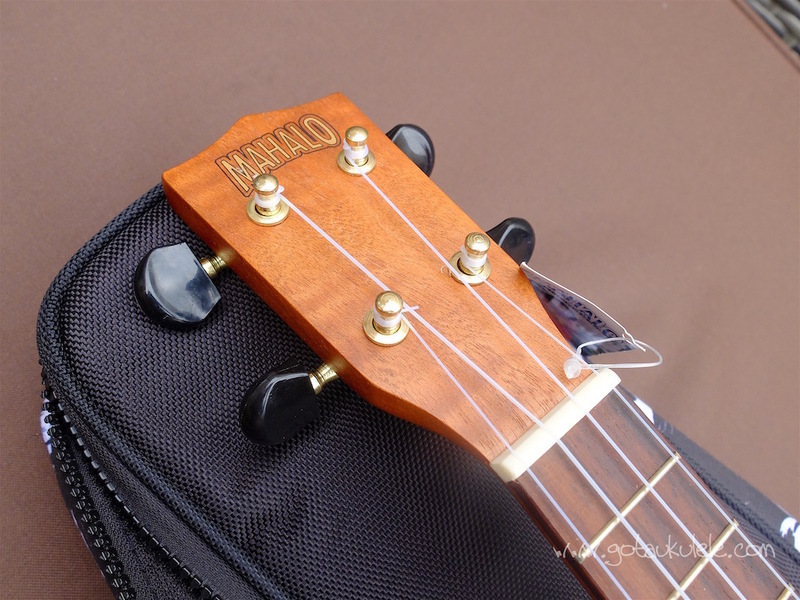 Thank you for your review on Mahalo's 2016K Soprano. As an long time ukulele dealer, we've never carried the Mahalo brand because it's too cheap and not worth spending your money on. We still won't carry this brand, better to spend a few more bucks and get Kala's Thin Body Travel Size Ukes, 3 different sizes with gig bag. I too think there are better alternatives, and do like those Kalas - just think there are far more alternatives that narrowing it to just that one.